Audio PA, side tone and wrap-up. 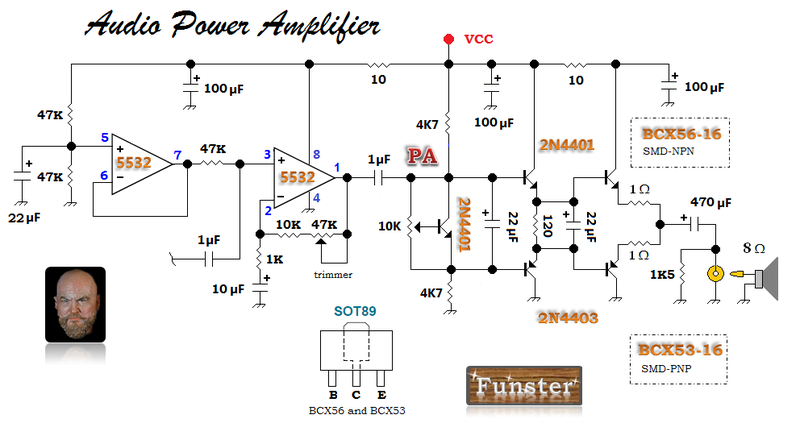 The most common home brew receiver part = the LM386 audio amplifier. A Signetics brainchild like the NE/SA602, the LM386 first appeared in home brew receivers in the late 1970s. The impact of the Signetics design team on modern home brew radio building exemplifies an outward phenomenon. Although, I too occasionally drive speakers with the old 386, distortion develops at just ~300 mW average power and nobody's ever called it a low-noise part; especially when the internal gain is set higher than 20. For years, I've plodded to find a popcorn discrete replacement for the LM386. In the Funster receiver, I evolved my basic popcorn AF PA design a little more — it still needs work, but I can look you in the eye and tell you that Funster sounds great and exhibits low AF chain noise. My earlier popcorn AF power amps ran low voltage gain and I didn't realize this was a problem until readers emailed to say so. I get it now — in our RF home brew community some expect the full-on gain (200) of the LM386! In contrast, when I run a 386, I set a gain of 20-50. Talk about different perspectives. That's what makes home brew RF design exciting. Above — My base popcorn AF stage with a 5532 non-inverting amplifier features adjustable gain to appease builders who rely on the PA stage for most of their voltage gain. You may change the fixed and/or trimmer series resistors between pins 1 and 2 to set your desired gain either by listening to your receiver, or crunching some op-amp arithmetic [ Vo = Vin (1 + R2/R1) ]. I fixed the other half of the 5532 op-amp as a voltage follower / rail splitter. The 2 power followers pairs are biased into Class AB by a 2N4401 level shifter. Tweaking the 10K trimmer pot even the slightest may change your idling or quiescent current dramatically; so carefully set the bias with your test equipment switched on. 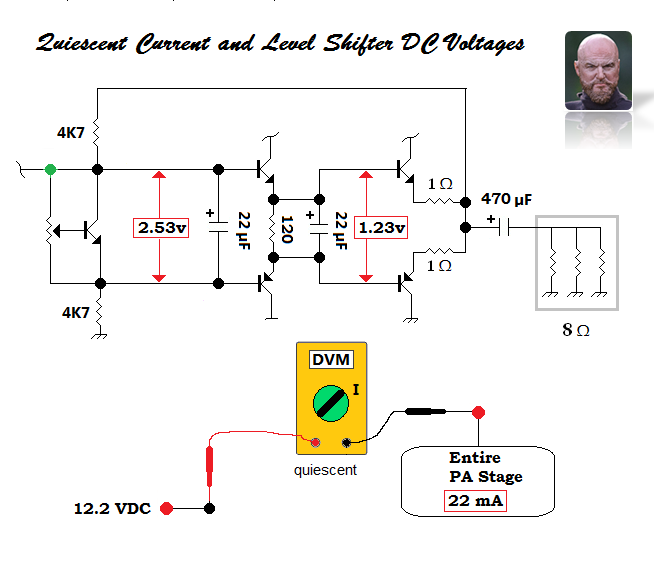 Above — Measuring quiescent current + the DC voltage dropped across both NPN/PNP power follower bases. Typical popcorn AF amplifier values are shown. 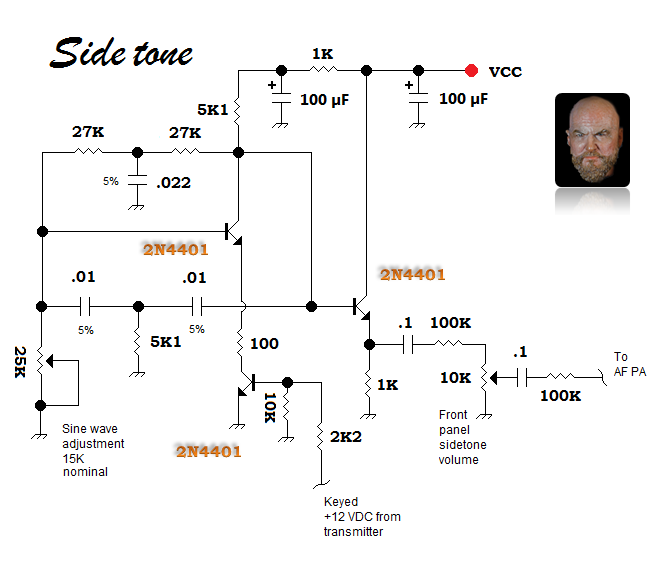 In most cases, you'll measure 1.1 to 1.4 VDC across the final pair with properly set bias. I set the final amplifier pair bias in the popcorn AF stage just like I used to with 100 watt guitar amplifiers: put an appropriate resistive load on the output, connect a signal generator to the input and tweak a pot to find the set point where the crossover distortion disappears. I keep 2 DMMs on my bench: 1 serves exclusively for power measurement and I never fire up a "just built" power amplifier stage of any sort without an ammeter connected between the DC power supply and VCC point. I only want to enjoy my measurement experiences — the ammeter will catch any shorts or other problems long before thermal runaway takes out your NPN power transistor (we rarely blow the PNP in a complimentary pair). With no applied signal, your ammeter will read the quiescent current of your whole PA stage (some purists argue that quiescent current only applies to the final complimentary pair). I usually set the bias and measure my quiescent current after the finals have warmed up. It's best to thermally couple the adjustable NPN level shifter to the PA heat sink, but you may omit this in popcorn-class PA stages. After setting the bias, switch off the signal source. After that, measure across the 2 BJT pair bases and then look to see what the ammeter shows. Expect 20-35 mA quiescent for a warmed up popcorn amplifier. Above — Average power measurement and formula. 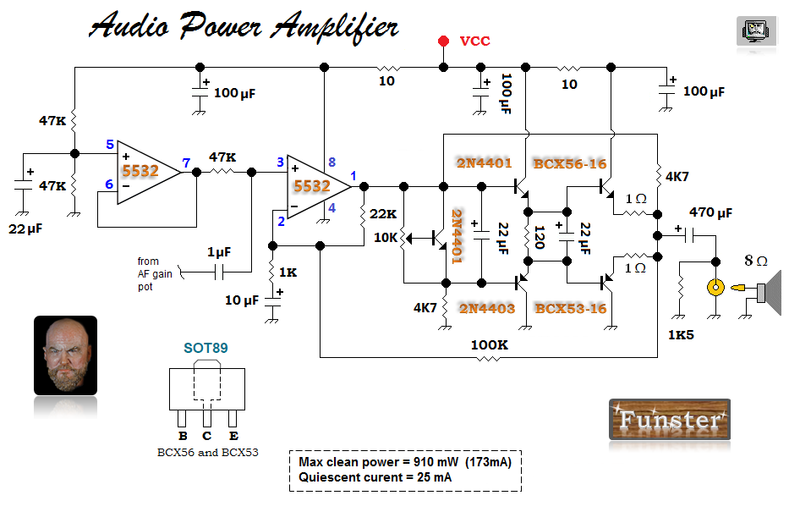 A 1 KHz low distortion signal generator makes a great weekend project — mine feature variable gain Wien bridge oscillators with 2-4 poles of low-pass filtration using extremely low-noise op-amps. Without solid measurement tools we're just bench lackeys. 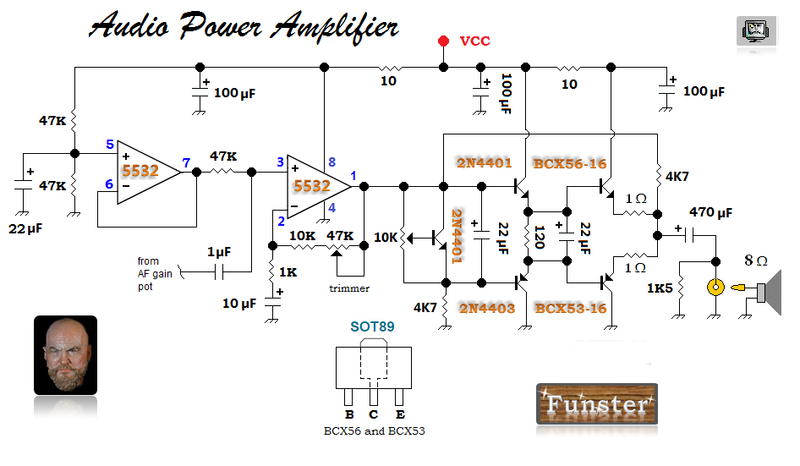 Back to the popcorn power amp shown earlier: 1 strength is that the sections labelled PA (the 1 µF and all the parts to its right) will add a PA stage to any voltage amp with a low output impedance. 1 weakness = the output is open loop — with no negative feedback to reduce distortion. In previous experiments, I left out the PA's 1 µF coupling capacitor plus the 4K7 resistors and just drove the power followers with a DC coupled op-amp output. This works fine for headphone-level output power — but I'm a speaker guy. When driving a speaker loudly during signal peaks, the drive to the followers may poop out and distort the signal with a glitch that resembles crossover distortion. Increasing the quiescent current won't fix the problem — I've tried that. Above — Distortion viewed when swinging a Vpeak-peak of 7v with DC coupled op-amp drive. Above — Evolution 1. I removed the 1 µF coupling capacitor (good riddance) and arranged the top 4K7 resistor to provide positive feedback. The op-amps were able to drive the followers all the way to normal harmonic clipping with no aforementioned glitch. The bootstrapping also boosted the maximum clean sine wave power. Above — Evolution 2. This final PA stage went into my Funster. I added a negative feedback loop via a 100 K resistor to put the op-amp into the loop. 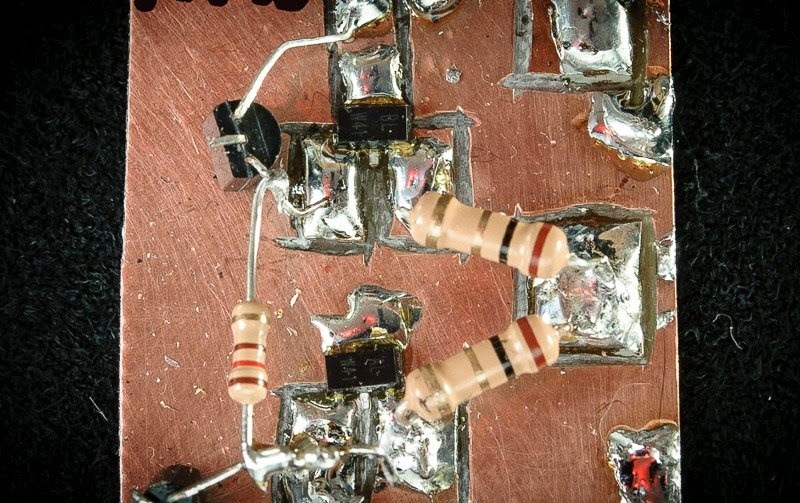 Do not put a parallel capacitor across the 100K feedback resistor as this will increase distortion in my positive + negative feedback arrangement. 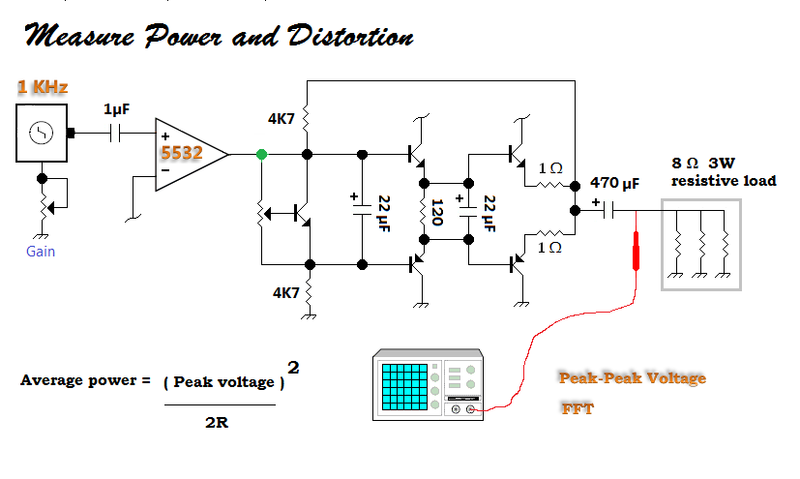 Above —The maximum peak-peak voltage of the final Funster PA design into a 8 Ω resistor load = 7.64 Vpeak-peak. To calculate average power we use the peak AC voltage, so divide Vpeak-peak by 2 to get Vpeak. Therefore Vpeak = 3.82v. So my clean signal (average) power = 3.82v * 3.82v / 16Ω = 912 mW. 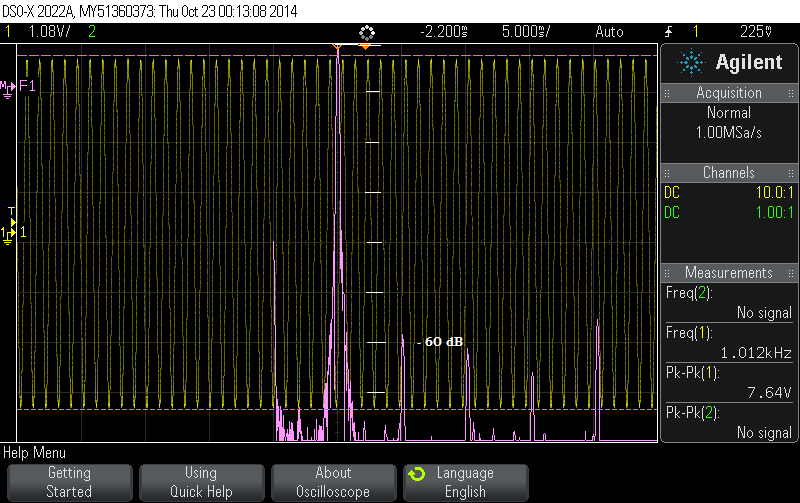 If I increased the drive on my 1KHz signal source any more, the AC signal began to clip. I pushed it just into clipping and then backed off until I eyeballed a pure since wave and got the Vpeak-peak = 7.64 shown above. 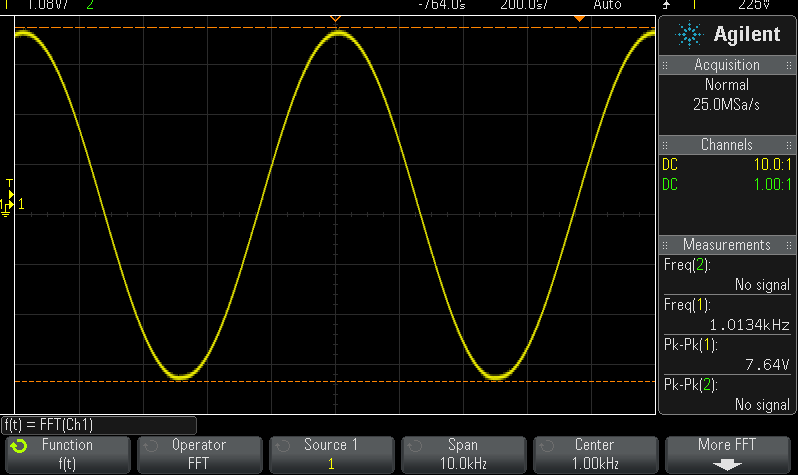 Admittedly, eyeballing the sine wave feels subjective, however, if you lack a distortion analyzer, a DSO with a good FFT or a sound card/computer audio analysis program, sine wave signal viewing works okay. Above — The FFT of the sine wave signal above on my DSO showing harmonic tones to the right of the fundamental 1.012 KHz signal. The second harmonic lies 58 dB down indicating my eyeball sine wave assessment works okay. FFT measurement is a better idea though. Above — Breadboard of the final popcorn AF amp I bolted in the Funster receiver. I added temporary RCA jacks and tested it on my workbench by listening to Funster. A shielded cable temporarily connected the installed tone/mute circuit to the rear panel RCA speaker jack. From the speaker jack I patched a shielded RCA cable to the PA input and connected the PA output to an 8 Ω speaker. This breadboard shown ran a 220 pF cap across the 100K negative feedback resistor — I promptly clipped it out since the capacitor generated distortion. I'll keep working on my popcorn AF power amp, but this 1 sounds good in Funster and certainly beats the old 386. Above — A phase shift oscillator circuit sent to me by Wes, W7ZOI awhile ago. I love Wes' side tone circuits and this sine wave generator combined with the mute circuit sounds makes Funster sound like a professional transceiver as I key the companion Funster transmitter. 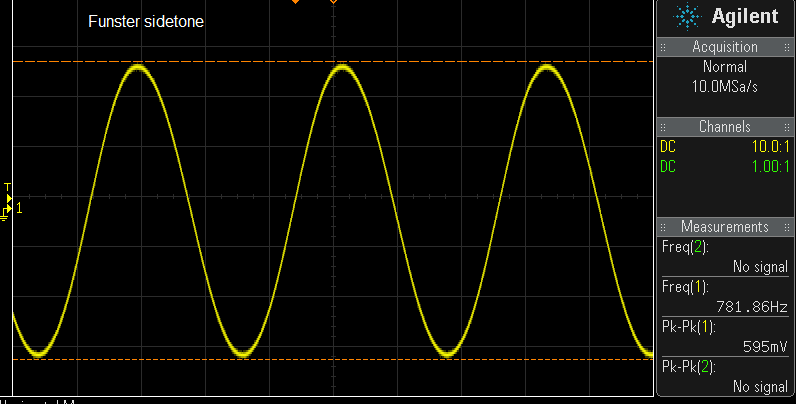 For amplitude adjustment, I added the 25K trimmer to get a sine wave in your 'scope. I measured and replaced the trimmer with a nearest standard-value resistor in my final build. Many sine wave AF oscillators don't fare well with downstream changes so I added an emitter follower with 4 mA emitter current + AC coupled a 100K resistor on either side of the 10K volume control. 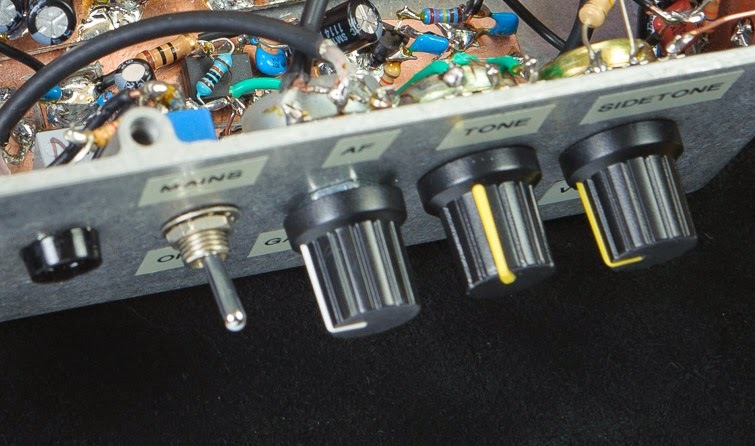 The 100K resistors, attenuate, isolate and add some low-pass filtration to the side tone output. The last 100K R connects to Pin 3 of the 5532 in the PA.
To "key" the circuit, ground the cold end of the 100 Ω resistor with some solid state switch or a key if you want to use this as a stand-alone code practice oscillator. For the latter, don't forget to add some key shaping to remove bounce-bounce clicks. Lacking the correct part, I substituted a 0.27 µF polyester cap for the 0.22 µF called for in the schematic and still pulled off a low distortion sine wave @ ~782 Hz. Above — The side tone signal in my DSO measured with a 10X probe. Above — AF stage breadboard with the side tone circuit added. 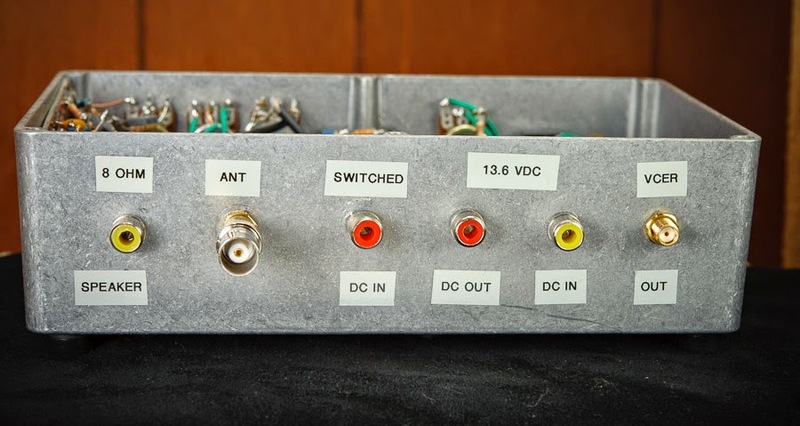 The Funster proves a relatively-simple DC receiver offering significant improvement over the standard direct conversion receiver with no opposite sideband suppression. 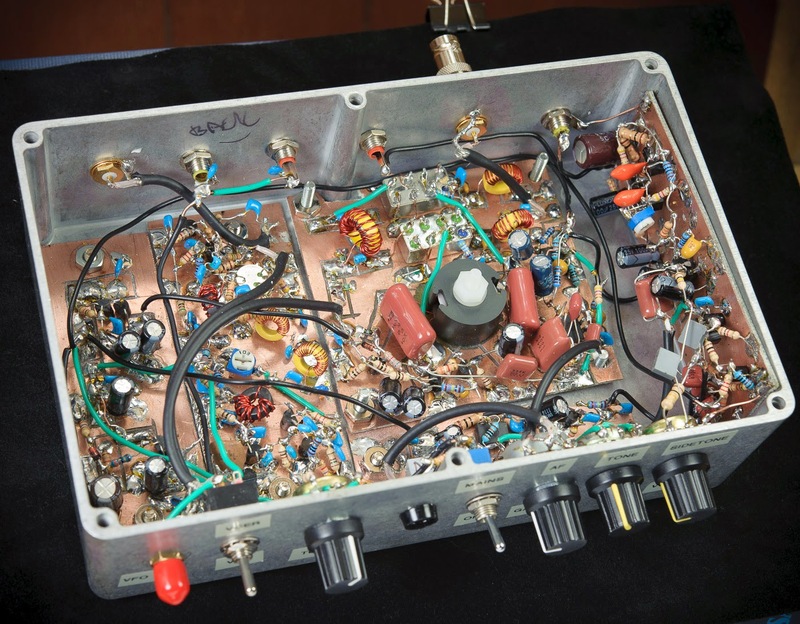 It compares well to the classic superheterodyne receiver that employed a single crystal filter plus front panel phasing control to provide a single, deep notch on the opposite sideband. As ever, by the time I complete a radio, I would have made it differently. Ours is a hobby where we make our circuits better over time with our test equipment switched on. Above — A close-up of the NXP BCX56 + BCX53 mounted in a prototype PA board. I ran no heat sink other than PC board traces for the collectors. A better choice might be the related BCP56 + BCP53 pair in SOT223 since the bigger package of this BJT pair better sinks heat. A good through hole substitute = the BD139/140 complimentary pair. 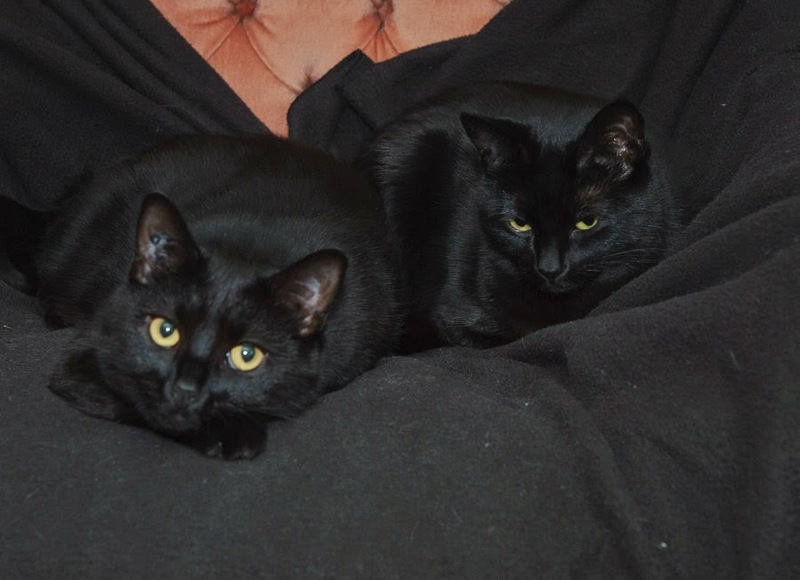 I love your workbench companions, nice black cats! !